There are a bunch of early arcade games that tried to ape the success of Space Invaders. Some were fun, many were forgettable. 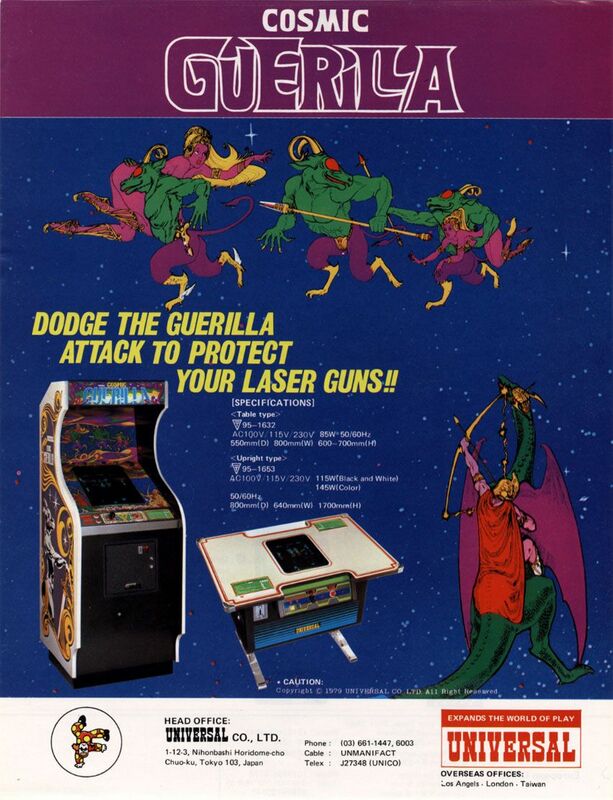 I've been playing Cosmic Guerilla on MAME and I think it's one of the very best of these early arcade shooters. In the game the enemies are goatmen (according to the cabinet artwork) arranged in columns on the left and right hand side of the screen, where you cannot shoot them. The center of the screen is dominated by temples (laser guns? pyramids? ), which represent your lives, and maidens (according to the cabinet artwork) that are guarding the temples. The goatmen begin advancing towards the center of the screen, and when they reach one of the maidens, they drag them off to the side of the screen, removing them from the game, then begin the trek back to the center to abduct more. If eventually a goatman reaches one of your temples, he will try to drag the temple to the edge of the screen, and if he succeeds you lose a life. As the levels increase the goatmen move faster and fire more projectiles. You have to juggle shooting goatmen on either side of the screen. Sometimes one goatman will get turbo charged and race in and abduct a maiden/temple at a high speed, and will keep stealing maidens until you manage to shoot him. Occasionally flying saucers will zoom in and try to shoot you, shooting it gives bonus points. A mothership sometimes flies across the upper screen and shooting it gives lots of bonus points. One aspect of the game I wasn't prepared for is that each "level" brings new goatmen, but you never get more maidens or temples (you can win an extra temple/life as a points reward). As your maidens/temples get stolen, that's it, they don't ever come back. This makes it imperative that you shoot those marauding goatmen that are running off with your maidens. Every time they succeed defeat looms closer. This game does the "frantic and hectic" thing very well. I have to say, this is one of the most addictive fixed shooters I've ever played, and I've tried to play all of them. I discovered it last night and woke up excited to play more. My highest score so far is 4910, and while not much in almost any other game, for an hour or two of playing I'm pretty happy with it. I do look forward to getting better. The ROM file does seem to be damaged. I get a warning in MAME stating that "There are known problems with this machine", and true enough, the game crashes on me sometimes. It will freeze and my score will start blinking and I can't seem to do anything about it. I'm using an older version of MAME so that might be the issue. I will note that the name of the game is nonsensical and ridiculous. Take the promotional flyer for the game. "Dodge the Guerilla!" What guerilla? "Protect your laser guns!" What laser guns? Is the player icon supposed to represent a temple, a laser gun, or an archer on a dragon? Because of the name I thought this game would be garbage, but it's apparently simply the victim of nonsensical marketing. That flyer blurb just seems a typical case of throwing some Engrish sentences together and being done with it. I quite like it this way, it's funnier, and "goatmen" seem to be in on the joke, hence the sly grins on their mugs. Edited by BigO, Tue Jan 1, 2019 10:22 PM. With newer versions of mame the warnings for this machine emulator are specific to sound emulation and cocktail flipping. Not sure if that means the emulator has been improved. Kidnapping the guards one by one is like guerrilla warfare. I'll have to give this one a try. I like these super-basic/challenging/addictive games from the late 70s and early 80s. Back when it was almost obligatory to make games somehow similar to Space Invaders, it's interesting to see what creative ideas and gameplay mechanics the developers would come up with in order to be somewhat reminiscent of Space Invaders, but at the same time, have something unique. Astro Invader is another one that comes to mind. 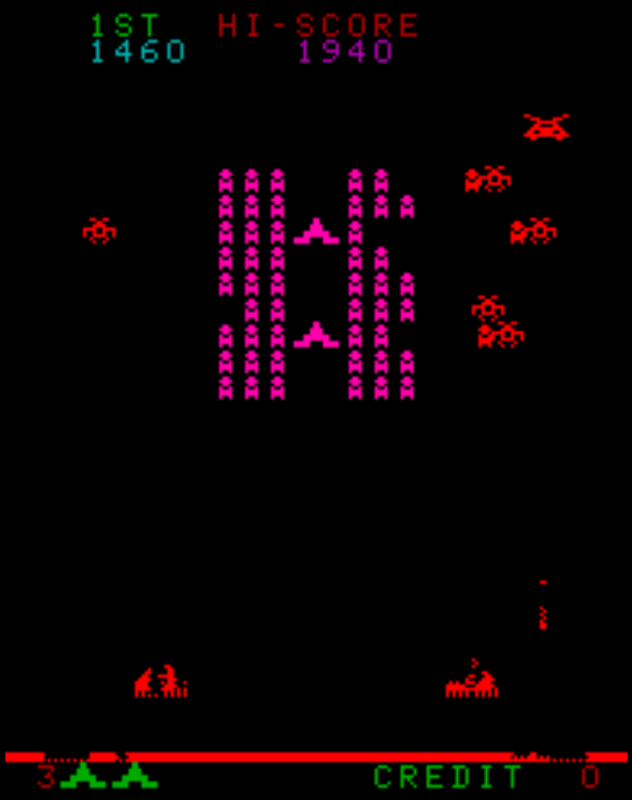 Clearly riding the Space Invaders wave, but adding in some unique touches to be its own game. Here's the issue I've been having. Sometimes when I lose a life the screen seems to freeze. The goatmen turn red, frozen in position. The maidens & temples turn pink. And the score (the 1460 in this image) starts flashing. Meanwhile, both the flying saucer and mothership (seen in the top of this image) continue showing up. Pressing start doesn't do anything, but I can still add coins and they register. 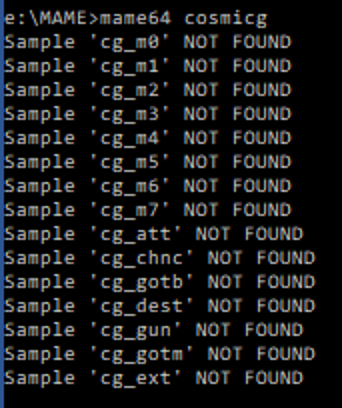 Furthermore, I noticed that when I run the ROM via command line it says I'm missing all the sound effects. I just assumed the game was silent. I wonder how I can fix this. Edit: I just tried this rom in MAME 0.205 and it suffers the same issues. No sound, and I still get the frozen screen with flashing score but the enemy UFOs keep periodically flying across the screen. Edited by Butt_Rogers, Wed Jan 2, 2019 1:22 PM. I tried the game last night and it ran fine on my cabinet, sounds included. Now, I can't vouch that the sounds are accurate, but the game definitely had sounds. They were very much like Space Invaders with the basic shooting noises and the dun-dun-dun-dun "music." Pretty fun game, although the little shield things (which, presumably are there for my protection) were driving me nuts because they make it difficult to get a clear shot at the enemies. PS - I run MAME v122. I too think the little shield things can be really annoying, however a couple waves in I find that the enemies are firing so many projectiles at you they can be a big help. I find myself ducking out from behind them to shoot the enemy and finding them more and more useful as the difficulty increases. My memories of this game are skewed, because the local laundromat had a "Cosmic Guerilla" marquee on a machine with a "Cosmic Alien" board in it for years, and I played it many many times. 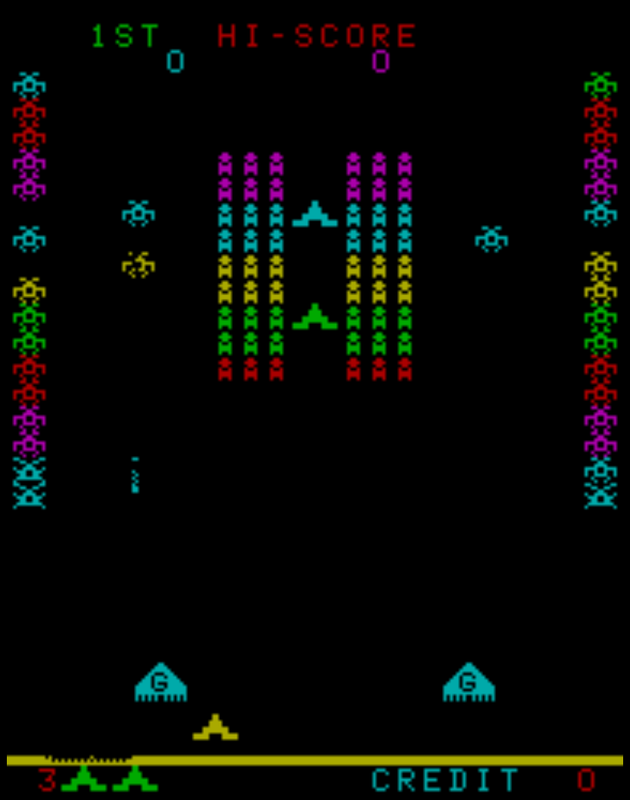 Regardless, it was a pretty fun Galaxian-style clone. I liked the abrupt ship movements... .i.e, they were not smooth and would suddenly swoop toward you really quickly. Plus it had a "boss" which was unique at the time. Edited by R.Cade, Thu Jan 3, 2019 1:21 PM. Can someone help me hack Space Invaders?